Equal parts exhilarating, horrifying and fascinating. 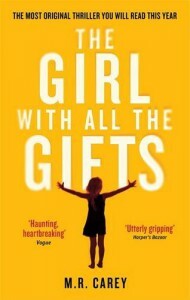 The Girl with All the Gifts is tension filled from start to finish. Once I started it, intending only to read a chapter or two, I couldn't.put.it.down. Just when you think you can't possibly read a fresh perspective on the dystopian/zombie genre, please pick up TGwAtG and see if the ending lives up to the hype. You won't be disappointed.